I used to think of muffins are really dry, boring breakfast pastries that really only mattered because of the tops, since that was where the best part was (especially if there’s a streusel topping involved). But, once you learn how to make the most perfect vegan muffins that rise to just the right height and replace a little of the sugar with a secret ingredient, you’re in muffin HEAVEN! Making vegan muffins is BEYOND easy, but you’re going to need a few tips and tricks. One of the biggest things is to NOT overmix your batter! If you overmix them even just a little bit, your muffins have a really good chance of not rising and becoming tough little hockey pucks, which is also something you realllly really don’t want. Light hand on the mixing! The muffin method is the best mixing method to use when making your vegan muffins, it keeps them nice and tender! The muffin mixing method is a method that is used for muffins, pancakes, and quick breads, basically anything that needs to stay super tender but doesn’t have a lot of fat added to the recipe. To mix using the muffin method, you’re going to whisk all of your wet ingredients together (including your fat, in this case it’s olive oil) and add them to the dry ingredients that have already been combined. Stir with a spatula until just incorporated, voila…that’s the muffin method! One last tip is to NOT overfill your muffin tin! Instinct is going to tell you to fill each one to the top, but that’s going to result in flatter muffins, rather than muffins that dome up and get nice and high. Filling them too full actually gives an opposite effect where it weighs them down too much and doesn’t give them room to rise, so go for halfway or 3/4 of the way full so your muffins still have room to rise and you’ll have the perfect amount of batter to make 12 muffins. Another big tip is to very slightly underbake your muffins. If you overbake them, it’s going to be a dry, crumbly disaster and noooo one wants that. The recipe time is perfect because it gets them to come out just baked enough, while still remaining moist, tender, and perfectly fluffy! I will say that these muffins are more of a ‘fluffy and hearty’ style muffin vs. GIANT bakery style muffins that are too much to eat in one sitting. I wanted a vegan muffin recipe that would be filling enough to eat for breakfast, but still wanted them to feel like a sweet treat. Vegan muffins with less sugar? It’s totally possible! 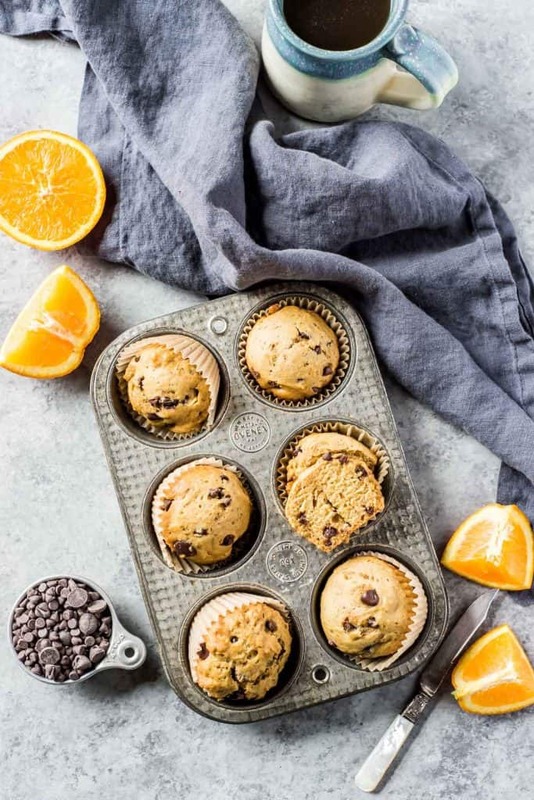 The key to making slightly healthier orange vegan muffins is to use something that can still give them a boost of sweetness, without taking away any of the rise factor or fluffiness of the muffins themselves. Zevia was a perfect solution because it still lends sweetness to the vegan muffins while helping leaven them (make them rise!) along the way. I would not recommend subbing in honey or agave for the whole amount of sugar in this vegan muffin recipe, because it would make them dense and the batter much too wet. Stick with the combo of real sugar and a bit of a bubbly drink and you will be left with PERFECT vegan muffins! Sugar can’t be totally cut out of this recipe, since it ensures that the orange vegan muffins are tender and still 100% delicious. If you don’t happen to have Zevia on hand, an alternative is to use carbonated water and a bit of stevia or agave, to sub in.